Down & Dirty: what does here taste like? 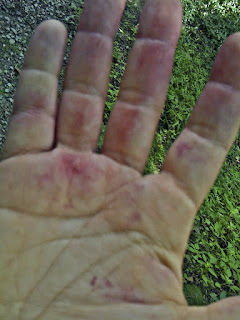 This is the hand of a blackberry picker. And blueberry picker. And mushroom picker. Yes, we picked all those things this weekend, but here, the stains and the scratches and thorns are courtesy of the noble blackberry. Blackberry bushes defend their fruit with a vengeance. I've had two thorns firmly embedded in my fingers since Thursday when Mark and I each picked a gallon in under an hour. Despite this I won't stay out of the brambles; the berries are irresistible. Yesterday we (Leda, Michael, Emma and Sophia (from Kitchen Caravan) and I) hoped to catch the end of the blueberry harvest. We are surrounded by highbush blueberries in this part of PA. No bending over to pick, plus, blueberries don't have thorns, so even though you have to bushwack, it's a kinder, gentler berry to forage. Little did we know there would be blackberries ripening among the blues. Truly, the abundance at this time of year is overwhelming. In our shorts and t-shirts, we were woefully unprepared for bramble picking but who could resist? Yes, I'm scratched and scarred, but I'd rather have a delicious dessert than unmarred skin. Why all the activity this weekend? Emma and Sophia brought their camera equipment (and culinary ingenuity) to make a series of short films for their website Kitchen Caravan, where September is local foods month. Leda and I did the menu planning, and everyone cooked. I cracked open several bottles of homemade wine, and the girls brought NYS Reisling. It was a delicious evening and fascinating to discuss what a local cuisine for this area might include. At this time of year, the possibilities are positively thrilling. Ask me in mid-January and I might not feel quite so optimistic. Then again, I plan to be eating my home-canned blueberries and blackberries all winter long! A fabulous food weekend indeed--HERE tastes really good! I'm so glad I finally got to visit during berry season! if you want. It was so good, and for some reason I don't think I'd ever have tried it on my own. Thanks Elizabeth! I've got tons of CSA peaches and nectarines now, too, so the salsa idea is perfect! Sounds amazingly delicious! Thanks for sharing! Spicebush is a native American shrub named Lindera benzoin that grows in part shade/part sun. Female plants produce seeds that are about a quarter inch long and ripen to a bright red color in fall. You'll need at least one male plant around for pollination, but it's the females that give us the spice. The dried and ground berries are both sweet and peppery; it's a delicious, complex taste unlike anything else I know. It's also an attractive shrub with good fall color (yellow leaves). You can order ground spicebush from Integration Acres (http://www.integrationacres.com/products.html). They call it Appalachian Allspice. Can we move in with you? Molly, you and Rye K. are welcome any time! We'd love to see you more often.